Scientists have assumed that habitats with intensive agricultural use are generally bad for bees, because of the exposure to pesticides and the very limited choice of food resources and nesting places. The worldwide extinction of bees was to some extent attributed to this factor. But bees are well able to thrive in agricultural areas, as long as they have access to so-called "habitat islands" with a high plant biodiversity. This has been demonstrated for the first time in a study by scientists of the University of Würzburg, together with other German and Australian researchers. They published their results in Scientific Reports. 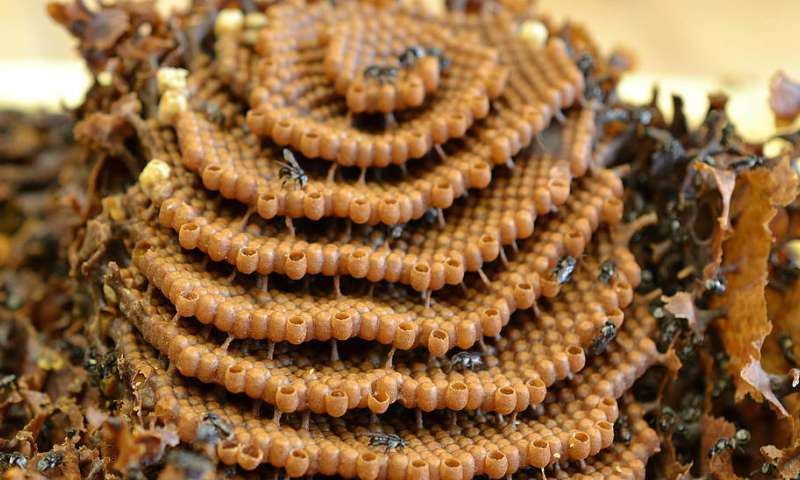 Tetragonula carbonaria is an Australian stingless bee the scientists studied for more than two years. "We used it to examine in an exemplary way whether the fitness and the reproductive success of social bees depends on the plant biodiversity surrounding them and the related quality of food resources," says Dr. Sara Leonhardt, in charge of the study at the University of Würzburg. Social bees include honey bees and stingless bees, among others. They are responsible for a large part of the pollination performance worldwide. To perform the study, the scientists installed bee colonies in three different habitats. "We chose natural forests, urban gardens and macadamia plantations with intensive agricultural use and observed the growth and the production of worker bees, queens and new colonies," says Dr. Benjamin Kaluza, lead author of the study. They also analyzed the nutritional quality of the pollen and honey collected, and charted the plant biodiversity in these habitats. What they found was that the bees' quality of life was highest in gardens and biodiverse forests, and lowest in plantations. As the plant biodiversity declines, bees produce fewer offspring, and colonies shrink in size. "Bees need diversity," says Kaluza. "Only in environments rich in plant species do they find continuously sufficient, balanced and high-quality food and other resources." Leonhardt explains that even small habitat islands with a high diversity of blooming plants in flight distance are sufficient for this effect to be apparent. "It allows them to compensate the negative influence of both pesticides and monocultures," she says, and adds: "This result means that the worldwide massive decline of biodiversity could be one of the main causes of bee extinction." What follows from their findings: "What we hope for now is, of course, more protection and restoration of biodiverse habitats, especially in regions intensive agricultural use, such as plantations," says Kaluza. Honestly, can we truly account for how much prssure bees have to be social? cliques in the hive can be vicious! However, being of a diverse nature actually HELPS bees fit in though. Everyone wants to have that one cool friend in their posse.